Our Hudson Valley, NY showroom opened in 2005 and was designed to give the lowest prices to our neighbors and most local clients- our distribution center is less than 5 miles away that serves the entire East Coast!!! We pridefully bring the best brands to the Hudson Valley – Come by and see our selection! We are in Poughkeepsie Plaza on Route 9, across from the Galleria Mall and Petco next door to Sleepy’s, Vitamin Shoppe and other great neighbors. Our large sign says FITNESS EQUIPMENT in red letters and we are open LATE nightly! Meet The Famous Seeing Eye Service Labrador Named Pete at our Hudson Valley Superstore! 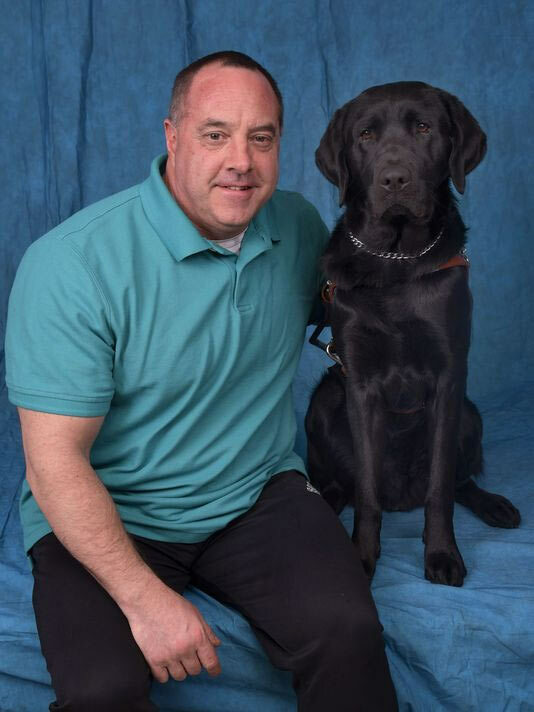 A Poughkeepsie man and his guide dog recently completed training on how to work together as a team. Jimmy Kriz and his black Lab, Pete, were among the graduates from across the country that completed training in Yorktown in April. Each of the graduates was paired with a trained guide dog provided at no cost by Guiding Eyes for the Blind, a non-profit organization. Read the full article at the Poughkeepsie Journal or view the pdf.